Leon Neal/Getty ImagesCustomers are served in a branch of the Carpet Right store on June 27, 2017 in south London, England. Moss Bros issued a profit warning on Wednesday and Mothercare, which has already had a profit warning, said its lenders are relaxing debt covenants. 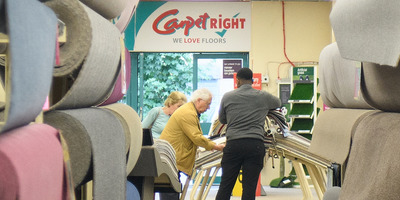 Carpetright has had to get an emergency £12.5 million loan, is trying to reduce its rent bill, and needs to raise as much as £60 million for a turnaround. All three are struggling with a consumer spending squeeze and the rise of online, both of which are hitting UK High Streets hard. LONDON – Updates from bricks-and-mortar retailers Moss Bros, Carpetright, and Mothercare highlighted the plight of Britain’s High Street on Wednesday. Traditional retailers with shops across the country are struggling to cope with falling consumer spending, caused by inflation, and the rapid rise of online shopping in everything from clothing to bedding. Carpetright, which saw shares plunge 40% in January on a profit warning, has had to tap up a major shareholder for a £12.5 million loan to keep the lights on. It is also seeking a CVA – an emergency deal with landlords to reduce rents – and, even if successful, will still need to raise up to £60 million to drive a turnaround. The company, which is valued at just £28 million in the current market, is in discussion with its lenders about relaxing debt covenants. Mothercare, whose shares fell 25% on a profit warning in January, said on Wednesday that discussions with lenders are “progressing constructively” and they have agreed to delay the testing of debt covenants. Progress, but from a low base. The plight of all three businesses highlights the crisis engulfing Britain’s High Streets. Toys R Us and Maplin have already gone into administration and the restaurant sector, which was thriving a few years ago, is rapidly shrinking. Debenhams has issued a profit warning and New Look is seeking a CVA to slash its rent bill. Traditional, bricks-and-mortar retailers are struggling amid a consumer spending slowdown and the relentless rise of online shopping. While High Street stores are issuing profit warnings,Amazon on Tuesday overtook Google as the second most valuable company in the US and online bed retailer Eve Sleep just last week touted sales growth of 132%. Things may begin to ease slightly for retailers as inflation pulls back. The ONS announced on Tuesday that inflation fell from 3% to 2.7% in February, meaning the spending squeeze that has hit the population since Brexit is beginning to ease. Walsh is now taking what Neil Wilson, a senior analyst at ETX Capital, dubbed “the nuclear option” to try and get his company fighting fit for the new economy. But as we’ve seen from Toys R Us and Maplin, the shift from the old offline economy to the new digital one can sometimes simply be too much for retailers. For many of Britain’s physical retailers, this is an all-or-nothing moment that they can’t afford to get wrong.